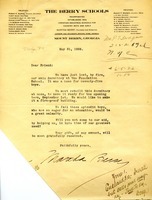 Note from Mrs. Low only includes the addressee "for The Berry Schools". 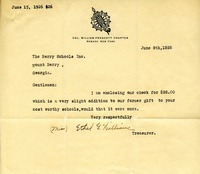 Berry worker noted that Mrs. Low sent $200. 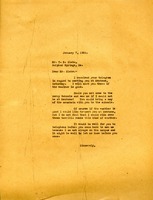 Letter documenting a $26.00 donation from Treasurer of Col. William Prescott Chapter, Newark, New York to The Berry Schools. 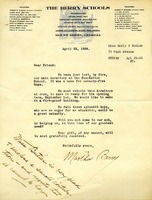 Col. William G. Prescott Chapter, donation, donation letter, donation to Berry Schools, Ethel G. William, The Berry Schools, The Berry Schools Inc.
Ms. Martha Berry and Mr. T.B. Blake are arranging a visit to Mentone, Alabama.